There is so much going on throughout Wisconsin this fall to help you celebrate October and Halloween. Choose a couple of activities to knock out this weekend to help get in the autumn mood. We’ve got you covered to make this fall the best one yet! Stock up on the best candy in town at Chippewa Candy Shop in Chippewa Falls. This Halloween be the talk of the town. All the neighborhood kids will love stopping if you stock up on Chippewa Candy Shop treats. From chocolates to gummies and everything in between. Start your Halloween off right! Schuster’s Farm in Deerfield is the perfect place to get into the Halloween spirit. Pick out pumpkins and seasonal vegetation as well as a kid-friendly petting zoo. Hunker down at night for their spooky corn maze and haunted forest. Feel free to spend the day at Schuster’s for their Eats and Treats and festive hayrides. Freakfest is an annual Halloween party hosted in downtown Madison, Wisconsin. 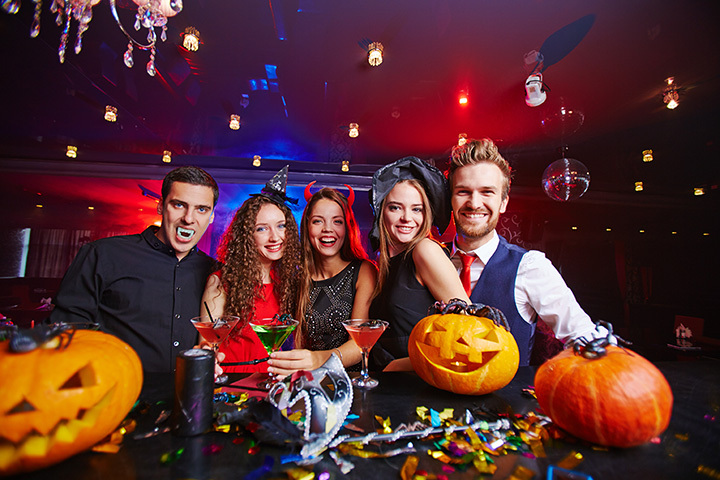 They invite bands, host live entertainment, and support all things Halloween. Bring your costume because State Street is one spooky place. We recommend not bringing kids to this event as it’s more of a large adult Halloween party. While there are plenty of seasonal costume stores that pop up in your town—there’s only one Fantasy Costume Shop. Rent or purchase the perfect costume this fall. They’ve proudly been serving in the costume industry since 1984. Check out their large industry of costumes for the perfect Halloween suite! Boy Scout Lane is an isolated road located in Stevens Point. Rumor has it that the road is haunted due to several Boy Scouts who passed away. Those who’ve dared to go down the road have reported feeling watched, lights in tress, lanterns, children laughing, and hand prints on their vehicles. Nevertheless, the road is popular during the months leading up to Halloween. Wisconsin Dells natives tell a spooky store of ancient canyons buried deep in the rock formations along the Wisconsin River, filled with dark creatures that haunt the passageways. The Dells Ghost Boat is a seasonal boating adventure that takes its passengers through a whirlwind of spooky quests. Buy your tickets today. Boo at the Zoo is an annual event at the Milwaukee Zoo. There are tons of spooky Halloween holiday events going on for the entire weekend. See lit up, hand-carved pumpkins, take a ride on Raven’s Rail Train, get lost in the haystack maze, and enjoy the beautiful fall weather as Milwaukee prepares for Halloween. If you haven’t already been, the House on the Rock has a couple of already creep displays. However, they host an annual event called “The Dark Side at the House on the Rock” that heighten the spooky dolls and displays throughout the house. Meander through their tricky maze and travel through the Devil’s Throat. Terror on the Fox is a Wisconsin Halloween tradition. This haunted attraction is celebrating over 20 years of fear. Two attractions can be found at Terror on the Fox—Blackthrone Manor and the Slaughterhouse. Watch your back in both because the echoing screams and sounds of chainsaws might just scare you straight. The Door County Trolley Ghost Tours offer two different tours. Try the Trolley of the Doomed and share sunken ghost ships, haunted lighthouses, and pressing mysteries along Door County’s peninsula. Or try the Haunted Olde Sturgeon Bay tour. Deep beneath the waterfront community of Sturgeon Bay are the spooky stories of murders, haunted buildings, and ghostly maritime stories. Sign up for an exhilarating change this Halloween.